This week in my home country, Australia, one of the newspapers opened up a Facebook dialogue with a refugee, Khadim Dai. Khadim is part of the persecuted Hazara ethnic minority in Afghanistan, fled to Pakistan with his family when he was a child. The dialogue brought to the surface all the issues that come with talking to the public about protection for populations that don’t have formal citizenship. It’s often a highly politicized, sensitive topic. But we hit a new low when one of the participants threatened to kill Khadim because he was a refugee. Yes, you read that right. He was being threatened because he was a refugee. It makes zero sense to me. A refugee has been found by the government or the UN to be in need of safety in another country other than the one he was born in. A refugee has had to leave due to a real risk in their ordinary lives. In my country there’s a political term bandied about often, that someone is a “genuine refugee”. That term is ridiculous in itself because every refugee has been subject to a rigorous approval process before receiving that status – there is no such thing as a non-genuine refugee. Full stop! On a day-to-day basis, I coordinate the Global Campaign to End Child Detention, which urges states to comply with the mounting evidence in international law that locking children up for not having the right paperwork is a child rights violation. In my campaigning world we often refer to refugees as “low hanging fruit” because, of all the populations which are locked up as children, refugees have the highest amount of legal protection. I also would have thought that refugees have the highest amount of public sympathy, but when I hear stories like what happened on this dialogue, I’m not so sure. groups of children who end up in immigration detention. 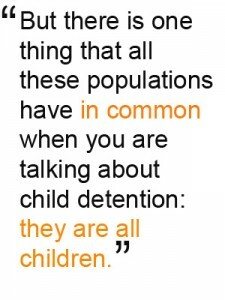 But there is one thing that all these populations have in common when you are talking about child detention: they are all children. Lots of documents call those under 18 years old “minors”, or children who come without their parents are called “unaccompanied migrants”. These kinds of labels contribute to the dehumanizing that allows death threats to be casually thrown over the internet to a refugee. 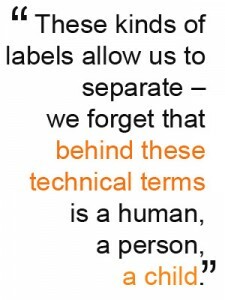 These kinds of labels allow us to separate my experience from their experience – we forget that behind these technical terms is a human, a person, a child. The way you use your language everyday can make an enormous impact on the ability of these children who are locked in detention being able to realize their rights. Join me in taking the “rant” out of migrant and using the word children instead. They are children, not minors, they are unaccompanied children, not unaccompanied minors. And last, but not least, they are child refugees, not genuine refugees. They are all children, first and foremost. There are alternatives to child detention that are cheaper and more humane: this message is at the heart of the Global Campaign to End Child Immigration Detention of Children, which Leeanne Torpey coordinates. 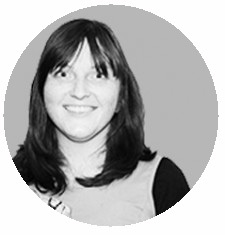 Leeanne has worked to develop and disseminate training in media to promote empowerment and community development. Full bio here.